One of the key aspects of the bull running in Pamplona is its intrinsic danger. Running in front of the bulls which are to face the bullfighters in the afternoon in the bullring implies a tremendous potential risk. Since 1924, when the first death in the history of the bull running was recorded, 14 runners have lost their lives in this event - twelve were gored and the other two were killed by blows or suffocation. 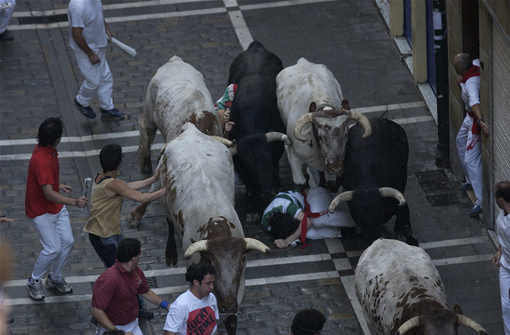 These statistics demonstrate that running in front of the bulls involves a considerable risk, given the fact that there have been deaths right along the route: 2 in Santo Domingo; 2 in the Town hall square; 1 in Mercaderes; 1 in Estafeta; 4 in the Telefónica - passageway zone and a further 4 in the bullring. However, to tell the truth, we should point out that it is safer to be actually running with the bulls than waiting at the side, given the fact that eleven of those that died were either standing still or had fallen over. However, apart from these sad examples, there are also many injuries during the running of the bulls. It is calculated that 1 in every 70 runners ends up with minor injuries, not requiring hospital admission - bruises, twisted ankles, etc; 1 in every 800 receives blows and serious traumatisms - particularly to the head - involving transfer to hospital; 1 in every 2,500 runners is gored and 1 in every 100,000 dies. However, and to demythologize the black legend hanging over the bull running, it should be pointed out that 95% of the injuries are minor and, moreover, in 90% of the cases these injuries are caused amongst the runners themselves, without the bulls and steers intervening. It goes without saying that running in front of six fighting bulls and eight steers careering through streets packed with people is dangerous, but it should also be pointed out that, with regard to deaths and injuries, the results of this run are far lower than would be dictated by logic. Just think that, over the last 100 years, 5,000 fighting bulls have passed through Pamplona, running 50 hours through the city's streets, covering a distance of 650 kilometres, summing up all the bull running events held, and that these bulls have been surrounded by more than one million persons. With these figures, the balance sheet of dead and wounded in the run is, objectively speaking, exceedingly low.